seeing politicians supporting either a minimalist state characterized by unfettered capitalism and individual rights or a relatively strong welfare state and regulatory capitalism. 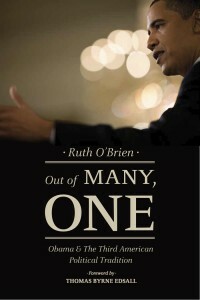 Obama, O’Brien argues, represents the values of a lesser-known third tradition in American political thought that defies the usual left-right categorization. stakeholder society that neither regulates in the manner of the New Deal nor deregulates. Instead, Obama focuses on negotiated rule making and allows executive branch agencies to fill in the details when dealing with a deadlocked Congress. Similarly, his commitment to difference and his resistance to universal mandates underlies his reluctance to advocate for human rights as much as many on the Democratic left had hoped. By establishing Obama within the context of a much longer and broader political tradition, this book sheds critical light on both the political and philosophical underpinnings of his presidency and a fundamental shift in American political thought.